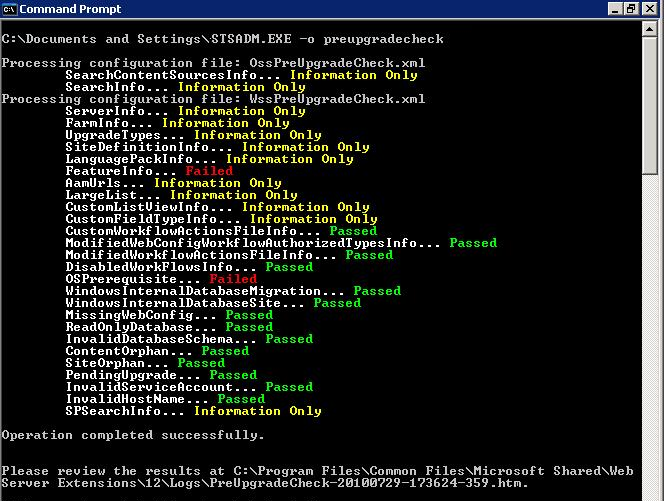 If your form installed with SharePoint 2007 ans sp2 then you can run the following command to identify if your deployment can be upgraded using one of the supported scenarios. Running preupgradecheck does not do any changes to your existing deployment environment or underlying data. By running the command you can get a report that will provide you with information on the state of your deployment. This report contains information that will assists in the upgrade planning process. You can find the report in 12hive location “c:\program files\common files\microsoft shared\web server extensions\14\LOGS”. If you need more information about preupgradecheck log then you will get the detailed analysis here.